Building a powerful professional network is critical for career success. Social media is more important than ever and so staying up to date and building your network online is really important. LinkedIn is still the no. 1 choice for professional network building (although Twitter isn't far behind and is actually my favourite place to connect with influencers - more on that another day!) so after you've made sure your profile is one to be proud of (not sure what that means? Check out this infographic) the next step is to join groups relevant to your market. There are so many groups on LinkedIn for (re)insurance professionals that it's hard to know which to join for the best information and online networking opportunities. The largest and most active Spam-Free Insurance Group on Linkedin- Group for property, casualty, life, health Insurance and annuity professionals, underwriters, risk managers, producers, claims personnel, home office executives and those who work in Insurance. Life Insurance, General Insurance, Property & Casualty, Health Insurance, Annuity, Pensions Professionals across the globe. Actuary, Re-Insurance, Underwriter, Policy Servicing, Claims. Financial, Banking Professionals also welcome to Join. This group is designed to be a melting pot for insurance underwriters from all backgrounds. In this group we will discuss relevant industry information, the current market, and overall strategy. This group is designed to promote career growth through establishing a national network of Insurance Underwriting professionals. Underwriters from all backgrounds welcome to join and contribute. The Institute of Risk Management (IRM) is enterprise risk management's leading international professional membership and education body. 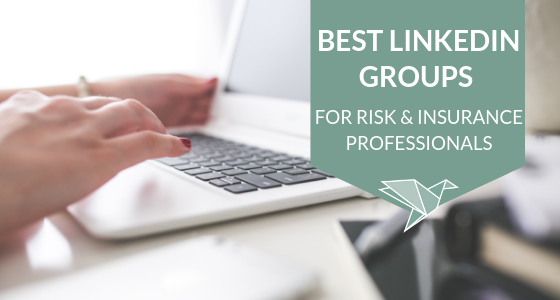 It is a not-for-profit organisation owned and governed by its members who are all practising risk professionals with an interest in ERM, GRC, BCM and all other aspects of risk management. Whether you see risk management as your profession or as a key skill, IRM membership can support you throughout your career. Membership provides you with information, networking opportunities and recognition. This group is one such example to assist members and non-members to communicate with one another regarding risk-related issues. The Women’s Insurance Networking Group (WING) provides a platform for networking among the insurance industry’s female leaders and enlightened males, those who understand the importance of diversity and equality in leadership in the insurance industry. Discussion focuses on industry hot topics, career development and the empowerment of women in insurance. This group is for Risk Managers to network and communicate, benefiting from each others' knowledge and experience. Have a group you'd like to add? Please drop me a line and I'll be happy to include it.